Christmas In Italy is a magical experience everyone should enjoy at least once. In Italy it’s always about the food, so naturally, Italians revel in the holiday season. There are many special dishes served only at this time of year. There are regional baked goods that are unique to each area, although now more are available throughout Italy and even in the United States. Panettone seems pretty easy to find these days, although, the ones shipped here for US consumption are not nearly as tasty or varied as those available in Italy. I especially love the holiday markets which are throughout Italy. Although some of the biggest are in the northern part of the country like Trentino-Alto Adige and Emilia Romagna. Florence, Rome and Naples are also filled with the holiday spirit. 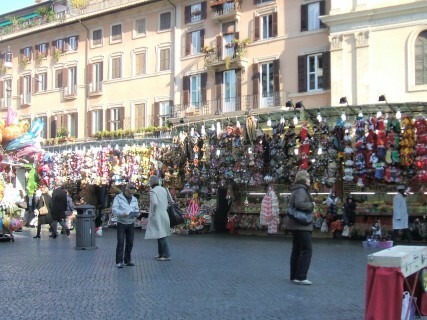 The most famous market in Rome is in Piazza Navona. There are fewer crafts people and more mass-produced items in the market than in years past, but the spirit is still contagious. There’s lots of music, singing and families enjoying the season wandering from booth to booth around the fountains. It’s magical at night to see the fountains lit and flowing amidst the crowds. Rome’s holiday season stretches much longer than ours. Christmas eve is the traditional feast of the 7 fishes (in some parts of Italy it’s 5, 9 or more or just ‘feast of the fishes’). Many families still hold strongly to this tradition, whether it’s actually 7 dishes or less. Usually there will be some fish antipasto, then a seafood pasta and definitely baccalà and anguilla (eel) if you are in Lazio. Christmas Day is less prescribed. It’s just enjoying family and as many dishes as you can imagine. Our most enjoyable Christmas in Rome was spent with our Italian family. I think we were 24 or 25 people in all. We managed to fill the room with a few tables and everyone moved around to talk with everyone else, while more and more food was served. And, then, Santo Stefano Day, which is the 26th of December. It’s a national holiday and often families will tour the nativity scenes (presepe) in town. In the town of Putignano in the region of Apulia they celebrate with a big Carnival, which, incidentally, is the oldest in the world and has been held for 616 years. Generally, Italians celebrate the holiday season until January 6th, the feast of the epiphany. It is also the day La Befana arrives. And, the story of La Befana is one of my favorites. 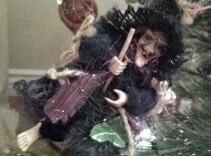 Gifts arrive with La Befana (the witch) who preceded Santa Claus and possibly even Christianity in much of Italy. Especially around Rome the tradition of La Befana is still very strong. The tale of La Befana, who was an old crone who was famous for cleaning her house and working in her kitchen is this. On the first Christmas, the Magi stopped by her house, asking directions to Bethlehem. She made them dinner and they told her, “We’re going to see the Christ child, want to come along?” “Impossible,” she replied. “There’s all these dishes to wash and the kitchen to sweep!” So the kings went on their way. Then, as the old woman was sweeping, it hit her: Did I make a terrible mistake? Could they really be going to see Jesus? She ran out the door to try to catch them holding onto her broom. She kept running, until her broom lifted her off the ground and she was flying. And, she’s been flying the night sky on the Eve of the Epiphany ever since. She delivers goodies to children, hoping one of them is the Christ child. She knows no child has been perfect all year, so she fills their stockings with a mix of treats – coal (actually a really delicious black rock candy) and all types of sweets. I’ve brought back flying Le Befane for many of my friends who love this tradition as much as I do. This entry was posted in Christmas and tagged Italian food, Italy, Shopping Italy.